DIAGNOSTIC FEATURES: Pointed, sterile podetia, central on squamules; mealy sorediate two-thirds of upper length; P+ red; compare with C. cylindrica with isidioid bodies toward base, grayanic acid, and C. macilenta with podetia not central, P-. 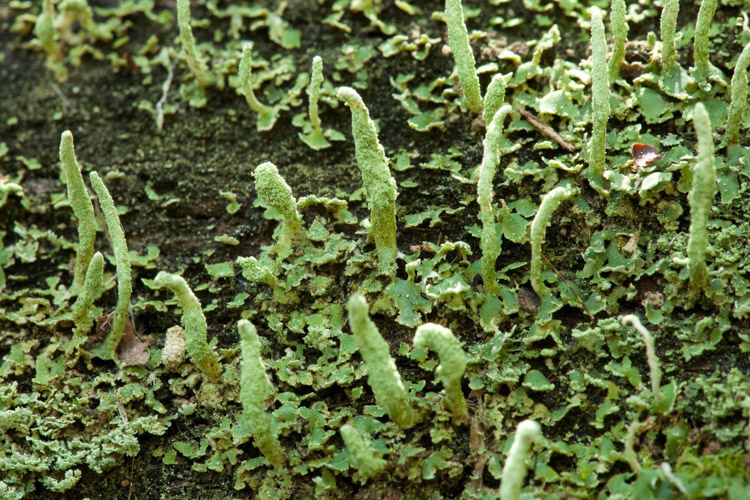 ECOLOGY: Common in the eastern US, Rocky Mountains, and along the west coast; widespread in Ohio, our commonest Cladonia with pointed podetia; on bark and various organic substrates, rarely directly on soil. Frequent on tree bases in wooded areas.